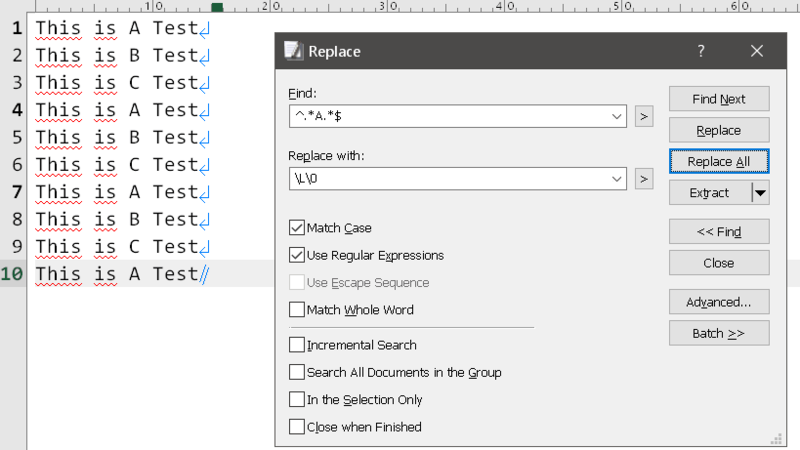 Now, select all visible lines and apply lowercase. Remove filter. Lowercase has been applied to all the the text. I lost 5 days of work due to this. Yep, I’ve fallen foul of the same too, at least twice or more times. Yes, but that does not make sense (it is not intuitive), only visible (filtered) text should be affected. Thanks for the workflow, but my example was just to point out the issue, I would need to change case in pretty varied scenarios. Currently, you can bookmark filtered lines by clicking the Bookmark All button on the Filter toolbar, and then select the Select Bookmarked Lines (on the right-click menu on the left edge or line numbers). I will consider adding the Select All (filtered lines) on the Filter toolbar in future versions. My usual workflow was to select some consecutive filtered lines (not full filtered text) and then apply the case change, would this still affect the non-filtered lines inbetween?